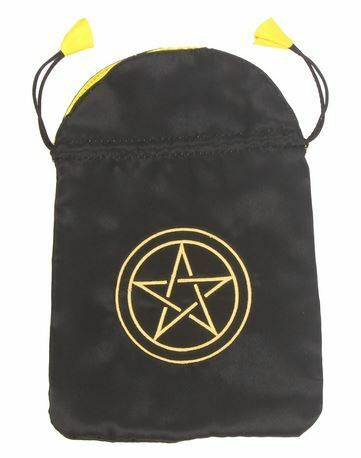 Attractive, convenient, and useful, this Pentacle tarot bag is the perfect way to safely store and protect your valuable tarot / oracle card decks. 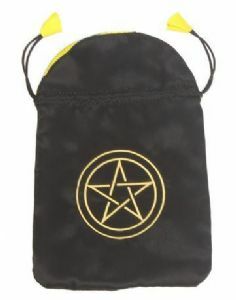 This lined black satin tarot bag is embroidered with a Gold Pentacle design. Two standard size (2.6 x 4.7 inches) decks will fit nicely inside this embroidered bag. Ideally sized for keeping your tarot cards and smaller spiritual items in, this Pentacle design will bless your contents while keeping them in pristine condition and style.